Send my first shipment today! You can choose to ship your order immediately, but all subsequent orders will ship on the day you choose each month. "First order date" indicates the day of the month you would like your initial and reoccurring orders placed. Orders typically ship within 5-7 business days of your chosen order date. The PetSafe® Replacement Pee Pads work with your PetSafe® Deluxe Crystal Litter Box System to help control odor and make scooping and cleaning your cat’s litter box a breeze. The absorbent pee pad acts as an extra layer of protection to catch any urine that the crystal litter does not immediately absorb. Simply slide the tray out from under the Deluxe Crystal Litter Box and replace the disposable pee pad. 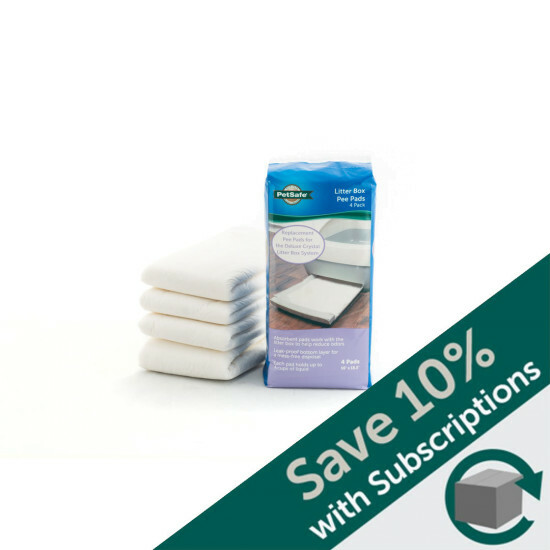 One pee pad will last up to one month in a single cat household.